Hi fives all around, baby! As CWB predicted last Monday, Wrigleyville and Boystown has reached the #1 spot on the Chicago Police Department's list of places to go if you want to be robbed. Well, they don't call it "places to go if you want to be robbed." 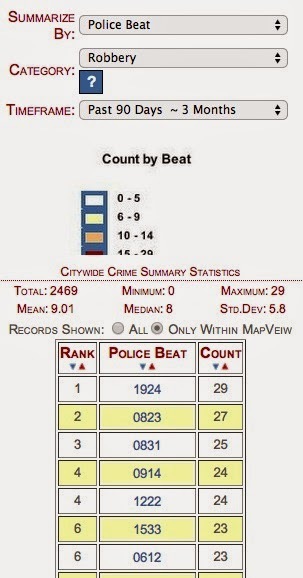 They call it "Ranking of Police Beat by Robbery Count — Past 90 Days ~ 3 Months." The department carves up the city into 274 individual patrol areas ("beats") and beat #1924, which covers the sliver of real estate between Belmont, Addison, Southport, and Halsted is now the most robbery-filled piece of land in Chicago. Beat 1924 also held the #1 spot for several months in 2013. Through July 7th, robberies in the whole of Wrigleyville and Boystown—police beats 1923, 1924, and 1925 combined—are down 27% compared to last year. Congratulations, everyone. Fireball shots are on us.